These prices refer to our cheapest hotel and our cheapest hotel with parking package available. The 'room only' price refers to the cheapest product available at Airport and the '8 day' parking price refers to the cheapest product available at Airport, both within the next 61 days, at 12am on 16/03/2019. Book one of our airport hotels and you can forget the rushing, the traffic jams and the time-keeping stresses. Enjoy a leisurely journey the day before your flight, then relax in the evening before a peaceful night's sleep. Save up to 40% with Holiday Extras and wake up knowing you're only minutes from the terminal, then take your time to enjoy a hearty breakfast before you make your way to the airport. A whopping 1.2 million travellers have booked a hotel with us in the past two years. Airport hotels from Holiday Extras received an average rating of 86% from 324,624 customer reviews. To find your airport, click on the appropriate area. *Please note: prices quoted are correct at time of writing and subject to change and fluctuations throughout the year. We always invite customers to leave a review about their experience staying in one of our airport hotels. Take a look at just a few of the comments and ratings left by real Holiday Extras customers below. We hope these comments can help you make a decision about which airport hotel to book and provide some assurances about our service. Very pleasant accommodation with food and drink at a reasonable price compared to other airport hotels. You need to regularly check the details you provide e.g. re transfer arrangements between airport hotels and the airport itself. I booked the Crowne Plaza at Heathrow because your information said there was a direct Hoppa bus transfer to Terminal 4. This service no longer exists and had stopped some time previously. I did not discover this until the morning of my transfer - luckily I'd allowed plenty of time to get to the airport for my flight. However, the additional hassle of getting a Hoppa bus to Terminal 2 and doing a transfer via the Heathrow Express was something I didn't need - it's a long walk too! Stayed at the Renaissance Hotel for the night before we flew,and left the car there until our return,and it all went perfectly well - we've done this numerous times before at various airport hotels,and most of the time through Holiday Extras,and it's always been fine. To explore more customer feedback from your airport simply click on the appropriate area. We sent professional hotel reviewers and photographers to all our Gatwick hotels so we can improve the way we present them on holidayextras.co.uk. Our reviewers spent a night and a day at each hotel experiencing everything our customers do, then they wrote about every aspect so you can now read a detailed and accurate description of each and every one. The first of our hotels we visited was the Hilton at Gatwick. We are working to improve more airport hotel pages for you and will be updating them soon. Why book with Holiday Extras? We are the UK's market leader for travel extras, with 34+ years experience under our belt, so when it comes to offering the very best airport hotels at the very best prices we've got you covered. Why not read about us and take a look at our recent Awards to see who Holiday Extras are and why we like to consider ourselves rather special. We work with a network of 8,000 travel agents, as well as several big-name intermediaries and partners, including the AA, British Airways, Saga Holidays and easyJet. When you book your airport hotel in advance with Holiday Extras you can save up to 60% off standard room prices. From 2-star to 5-star hotels, and big brands to smaller, independent hotels, we have the right hotel for you no matter what your taste and budget may be. At many hotels we also have exclusive deals for our customers - including dinner, breakfast offers/discounts, and kids eat FREE at selected hotels. If you're driving to your hotel, be sure to book one of our airport hotels with parking packages. At Holiday Extras we are able to negotiate exclusive deals on airport hotels with parking that guarantee to save you money, compared to booking your room and parking separately. It may be hard to believe but adding parking can sometimes even work out cheaper than just booking your hotel room on its own! With this option you'll leave your car in the hotel's own car park for the duration of your holiday. Park, sleep and fly - nice and simple. To get to and from the airport you'll need to catch a transfer which, depending on the package, will be in the form of a transfer bus or taxi. Park at a secured car park either at the airport or close-by, with free and frequent transfers to and from the airport terminal. Your car will be safe under the watchful eye of CCTV and floodlighting, while you relax on holiday. With this type of package you'll usually leave your car in the hotel's car park overnight then, on the morning of your flight, drive to the airport. Here you'll meet your fully insured driver who will take your car to be parked in a secured car park. On your return the driver will deliver your car back to you at the terminal, so there's no need to struggle with your luggage back to the hotel. Courtyard by Marriott with Meet and Greet parking - A 4-star stopover just 0.5 miles from the North and South terminals. To make your airport experience even smoother you won't even need to worry about your parking - your chauffeur will take care of everything. Sofitel with parking at the hotel - This luxurious and ultra convenient 4-star hotel is just a 3 minute walk to the North terminal via a connected walkway and 5 minutes to the South terminal on the free monorail. Leave your car in the hotel's secured car park for the duration of your trip. Holiday Inn with parking at the hotel - Located just a 5-10 minute transfer to both terminals, boasting 4-star facilities, low prices, and fuss free parking on-site it's easy to see why it's a customer favourite. Premier Inn South with Jet Parks 1 - This well-known, 3-star hotel has everything you need for a comfortable stay without making a dent in your holiday budget. Park at the hotel overnight, drive to Jet Parks 1 the next morning, park up and hop on the transfer bus to the terminal. Transfers take less than 12 minutes. Clayton with secured parking - Located within the airport grounds this 4-star hotel is sure to get your trip off to a flying start. From the hotel to Terminals 1 and 3 it's a 2 minute shuttle ride, to Terminal 2 it's a 5 minute shuttle. Leave your car at the hotel and a member of staff will take your car to be parked in a secured facility nearby. When you return your car will be ready and waiting at the hotel. Britannia Country House with parking at the hotel - Perfect for travellers on a budget, the 3-star Britannia Country House hotel is amazing value for money while still boasting great facilities including a pool, spa, choice of restaurants and a 20 minute transfer time. To keep things nice and simple your car will stay in the hotel's car park for the duration of your trip. Thistle with parking at the hotel - The 3-star Thistle is ideal if you're flying from terminal 5; you're just a 5 minute POD shuttle ride away. To reach the other terminals, simply catch the Heathrow Hoppa from right outside the hotel. From the free wifi, free breakfast to the fuss-free parking it's easy to see why this is a popular option with our customers. Crowne Plaza with parking at the hotel - Enjoy 4 star facilities including a leisure club and award winning food, quick and easy transfers to the terminals, and secured parking at the Crowne Plaza. This hotel is great for all terminals, you're just 10-20 minutes away on the Heathrow Hoppa. Park Inn with parking at the hotel - What makes the Park Inn at Heathrow so popular with our customers? For starters it's located less than 15 minutes from all terminals, it's also family friendly, boasts 4-star facilities including a gym and swimming pool and, even better, it's pretty easy on the wallet too. When it comes to parking, your car will stay put in the hotel's on-site car park. At Holiday Extras we want help you stretch your holiday budget further. For money saving tips and exclusive offers on airport hotels, you're in the right place. With over 34 years of experience it's fair to say we know a thing or two about travel extras and the best ways to pocket more pounds. Take a look at our top tips below on easy ways to pay less on your airport hotel so you have more money to add to your holiday savings pot. We offer an innovative way of getting a fantastic deal on cheap airport hotels. The identity of our Mystery airport hotels remains, as the name suggests, a mystery until after you book. You'll be told the distance from the airport and the star rating of the hotel to help you decide. For peace of mind we only offer these special rates on 3-star or 4-star stopovers so there's no need to worry about the quality of the hotel. Prices start from a staggeringly low £43 for room-only at Heathrow airport and a unbeatable room-only price of just £53 at Gatwick airport. If you're sure your plans are set in stone be sure to keep an eye out for our non-flexible deals marked "can't cancel, can't amend". These packages offer the very same hotels but at an exclusive lower price but for this reason once your booking has been completed it can't be changed or cancelled. A nice and easy way to knock extra pounds off your booking is to book in advance. We also recommend the sooner the better! When you pre-book with Holiday Extras not only will you be more likely to making a healthy saving of up to 60%, you're also much more likely to have a wider range of airport hotels to choose from, meaning it should be easier to find a package that best suits your budget. We want to ensure we're offering the very best prices on the very best airport hotels which is why we're proud to offer our Never Beaten On Price policy across all of hotel packages. If you find the same product cheaper, within 24 hours of booking with us, we'll match the price. Over our 34+ years experience we've formed great relationships with a range of hotel brands, which, in turn, has meant we've been able to negotiate exclusive deals for our customers on upgrades such as breakfast, dinner and kids dining at selected hotels. For example at the Courtyard by Marriott at Gatwick you can save nearly £5 per person when you pre-book your breakfast with Holiday Extras. To sweeten the deal with every paying adult, 1 child under 12 eats for free. When it comes to dinner deals, at Manchester airport for example, you can enjoy a delicious 3 course meal for just £25.00 - that averages out as a saving of around £3 per person. Our upgrades are available at a range of locations including Gatwick, Heathrow, Manchester, Stansted, Luton, Birmingham, Glasgow, Aberdeen, East Midlands or Newcastle. You can browse our full range of upgrades, including travel insurance, Fair FX cards and airport lounges, after you've made your hotel selection, before the payment page. You needn't always drive to the airport. We offer 3 very cost-effective alternatives for getting there which are very easy to use and available to book at a great price. Take away the stress of driving to the airport and let a friendly and experienced driver take care of all the traffic and navigating with an airport taxi. Getting a taxi to the airport has a reputation for being expensive but not when you book with Holiday Extras. There's no need to call lots of local taxi firms trying to find the cheapest rates, instead simply enter your travel details in the search engine and we'll return the best prices with zero hidden fees (parking/waiting/tolls are all included in the service). For your convenience there's dedicated 24-hour customer support and you can cancel with no charge up to 4 hours prior to departure. Get to your airport hotel by rail. You can buy train tickets here with us much cheaper than if you purchase them on the day at the station. Sit back and relax while you're speeded to you destination with no worries about traffic or parking your car. Children under 5 always travel FREE too so it works out cheaper than you might think. Let someone else to the driving and be taken straight to your hotel with our airport hotels by coach packages. Check where your nearest pick up point is and book tickets in just moments. The coach will then drive you directly to your hotel - super convenient and great value for money! 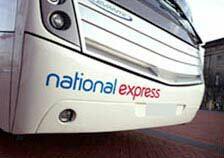 We've teamed up with National Express to be able to offer this service and are very pleased to be able to provide another very handy holiday add-on. ...In which case just keep the button selected for Airport hotels with parking in our search engine above, and we'll return quotes for all the best packages. Some hotels operate parking slightly differently so have a read through the details. For example, some hotels offer parking on-site in their own car park and then provide a hotel transfer bus on request while others require you to drive to a nearby secured car park facility who operate regular transfers to the terminal. Take a look at our most popular airport hotels at the busiest UK airports. We only supply the best hotel's to our customers and even if it's not one of the UK's busiest airports you're flying from you will still find a choice of top quality hotels that have something for everybody and are guaranteed to suit all your travelling needs. For smaller airports where there are fewer hotels to choose from, we still guarantee the hotels we offer are the best available, for the lowest possible price. Southend airport hotels for example, have a choice of two hotels but these two hotels cover everything you would expect (and more!) from an airport hotel. We have a wide selection of hotels at Gatwick airport which include the Gatwick Hilton, a 4-star hotel with great leisure facilities and dining options as well as its own Costa coffee shop, and the Gatwick Russ Hill hotel which is one of our top-sellers due to its budget price, nearby countryside location and tremendous value for money. Have a browse through our 28 Gatwick hotels to see which might suit you best. The Heathrow Hilton is one of our most popular hotels at Heathrow, promising everything you expect from this quality brand including a beauty salon, health club and 3 restaurants. Another best-selling hotel is the Heathrow Sofitel which always offers very competitive prices as well as 5 star quality. The 24 hour gym is free to use for guests and the hotel itself is connected to Heathrow's terminal 5. You're spoilt for choice at Manchester airport but the Manchester Crowne Plaza hotel is regularly one of our most successful offerings. It is perfectly located on-site at the airport and boasts some beautifully decorated rooms.Another noteworthy hotel is the Manchester Radisson SAS airport hotel. It offers quite a unique stay with 4 different room decor's and is connected to Manchester airport via a covered walkway. We're very proud to offer the Novotel boasting 4-star facilities including a 24 hour gym and a simple 6-minute transfer to the terminal. Another great option to consider is the Stansted Radisson Blu hotel which is actually connected to the airport via a covered walkway! Enjoy brilliant facilities including a choice of 2 restaurants, themed rooms and even a pool. We have a brilliant selection of hotels at Luton airport including Ibis and Holiday Inn Express both highly rated by our customers and it's easy to see why. These 3-star stopovers are located on-site, boast fantastic low prices and can be packaged with hassle-free parking options. Alternatively there's options like the Hilton Garden Inn. Located just 2.3 miles away from the airport and boasting a range of 4-star facilities including a fitness centre, the Hilton Garden Inn is a great way to kick-start your trip with convenience and style. Whether you're looking for an affordable, no-frills stay like at the on-site Ibis or if you want to treat yourself to a bit of 4-star luxury at the Novotel, also located on-site, we have a hotel at Birmingham airport that will suit you. If you'd prefer to be away from the hustle and bustle of the airport we also have a number of great hotels just a short transfer away, such as the 4-star Best Western Meriden Manor. Get your trip off to a relaxing start (or finish) with one of our excellent hotels at East Midlands airport. Stay just a few minutes walk away from the terminal at the 4-star Jury's Inn. For a hotel that's easy on the wallet, within easy reach of the airport and equipped all the essentials for a comfy stay be sure to check out the Best Western Nottingham. For a little bit of pre-holiday luxury there's always the Hilton hotel to consider; 4-star facilities, fine dining and just under 2 miles away from the airport. We've got the very best selection of hotels at Edinburgh airport from the 4-star Doubletree by Hilton one of the closest hotels to the airport, just a 2 minute transfer away to the ultra convenient Holiday Inn Express that offers a complimentary breakfast and runs its own 4 minute shuttle to the airport. Another firm favourite with customers is the Travelodge hotel; dependable, comfortable and just 1.3 miles from the airport.